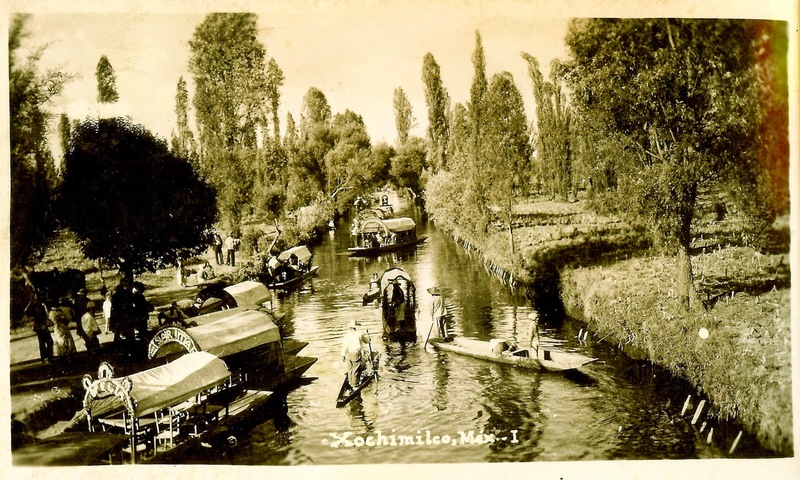 We wrap up our postcard series by visiting one of the loveliest stopovers Phil and Benita made during their 1937 vacation, the famed floating Gardens of Xochimilco, in the southern region of the Federal District (Distrito Federal), about 40 minutes from downtown Mexico City. A family enjoys their outing in a “trajinera,” or flower-decked gondola, as a young flower vendor poses in her “chalupa,” or vendor’s barge. Postcard; Mexico, 1937. From Benita (McGinnis) McCormick’s scrapbook. Vendor-photographer, his camera mounted on a tripod, pauses on his “chalupa” as he awaits an approaching gondola of tourists. 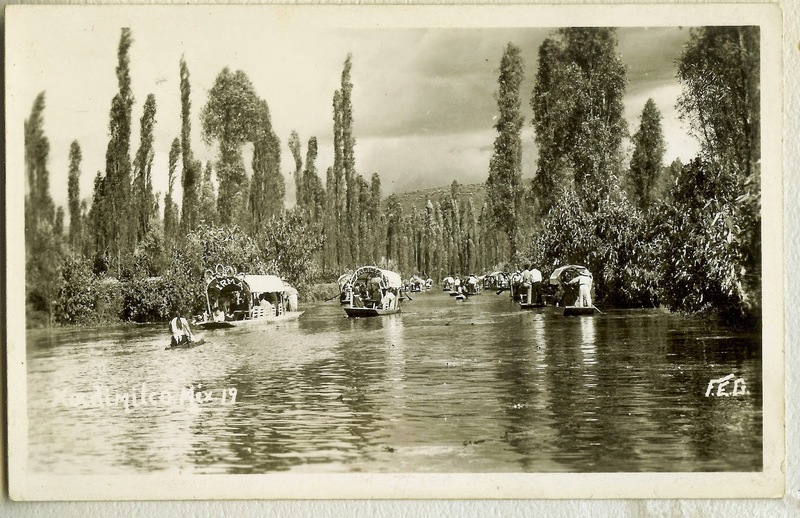 Postcard; Mexico, approx. 1930s. From Benita (McGinnis) McCormick’s scrapbook. 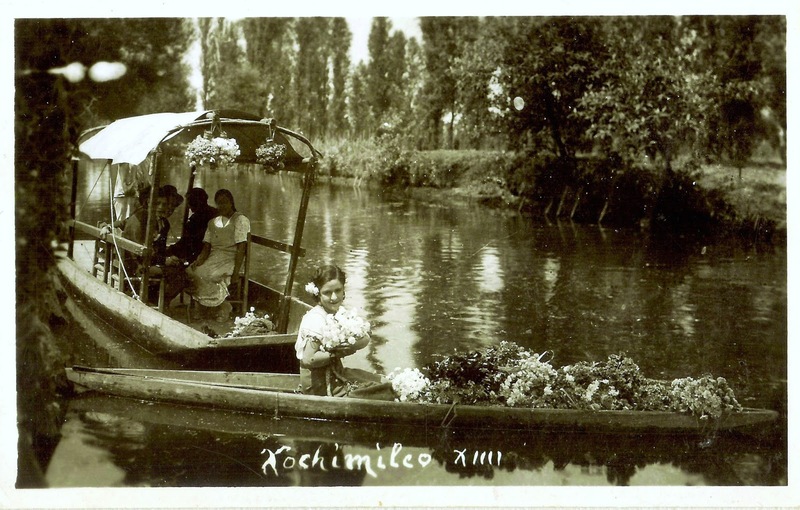 Derived from the Náhuatl words xochitl and milli, Xochimilco means “field of flowers.” Over eleven hundred years ago, the city was built on a lake by the Xochimilca tribe as a system of man-made islands, called chinampas, and canals for farming and navigation purposes. 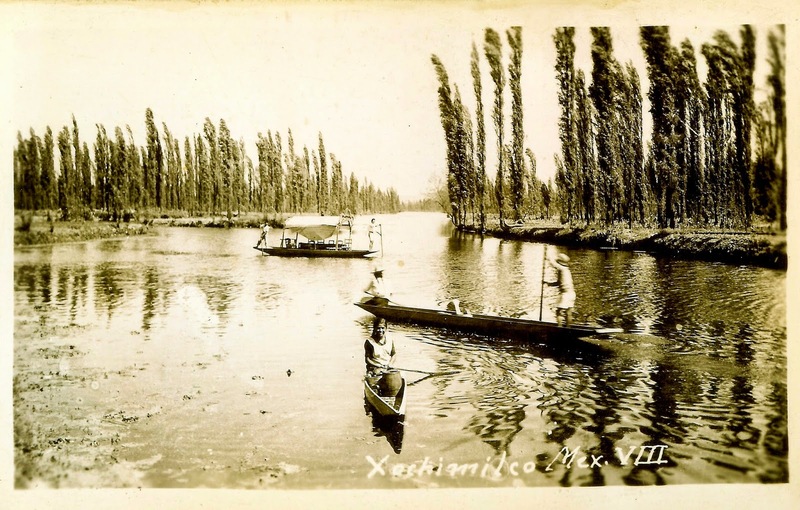 It later was expanded as a waterway to the ancient Tenochtitlán, another city on a lake which would one day become the center of Mexico City. 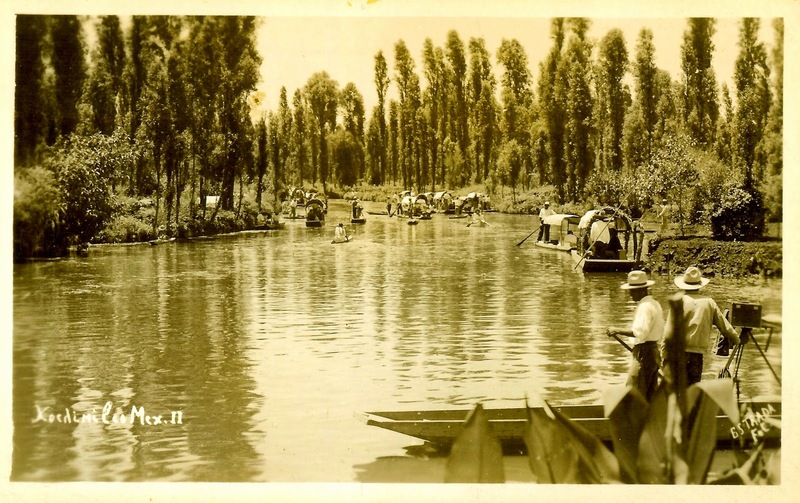 Back in the 1930s, as today, colorful trajineras, open air wooden gondola-like boats covered with elaborately decorated arches, glided lazily through some 110 miles of canals, offering tourists and Mexican families on weekend outings a chance to convivir, or enjoy one another’s company. Tall and graceful, Juniper trees line waterways in Xochimilco. Postcard, 1930s, Mexico. From Benita (McGinnis) McCormick’s scrapbook. Phil and Benita and their friends, John and Mary Coates, probably spent an idyllic afternoon here. Always living in the moment, they would have laughed and told stories, feasting on a picnic lunch and reclining on the long wooden benches of their trajinera. As the hours passed, they would have bought flowers and souvenirs and enjoyed the music coming from passing canoe-like chalupas. Maybe Phil and John would have even hired a group of mariachis to serenade their wives with a love song such as Agustín Lara’s “Veracruz,” and the two couples might have found themselves dancing in that carefree way that travelers do when the boundaries of time and language and space melt away into a languid infinity. Mexico. From Benita (McGinnis) McCormick’s scrapbook. Diane, you made my day! I have been "away" for a while (our family is in the midst of selling our home and buying/moving into another) and have been unable to post anything for a couple of months, as I have had limited access to computer and internet. As I gear up to resume researching and writing, I am heartened by and grateful for your kind word, especially given your own fascinating blog. Thank you so much.